SX Series, Active Monitor from ADAM. The new SX-Series reference monitors feature redesigned transducers, drivers, and electronics. All ADAM SX-Series monitors feature the new X-ART tweeter, designed to provide 4dB higher efficiency, an increased maximum sound pressure level of 3dB, and an expanded frequency response of up to 50kHz. Other new components include an ultra-low distortion broadband A/B amplifier with 1MHz internal bandwidth, perfectly matched to the X-ART tweeter for a natural, uncolored sound with high resolution, and new Hexacone woofers with more linear excursion to optimize efficiency and accuracy, ADAM says. 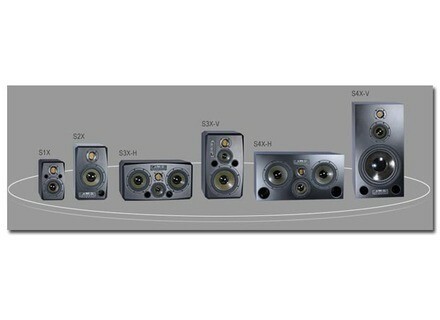 The SX-Series consists of six different models ranging from small nearfield monitors to larger midfield monitors. To facilitate operation in any control room situation, the S4X and S3X models are available in both vertical (S4X-V/S3X-V) and horizontal (S4X-H/S3X-H) versions. Designed for medium and larger sized rooms, the S4X-H midfield monitor combines the new X-ART tweeter with a 5" HexaCone midrange driver and two redeveloped 9" HexaCone woofers. Designed for vertical installation, the S4X-V also incorporates the X-ART tweeter, with two 5" Hexacone drivers and a newly developed 12" Hexacone woofer optimized electronically for a bass-reflex enclosure. The S3X-V features the newly developed 4" HexaCone midrange driver and 9" HexaCone woofer with the X-ART tweeter to reveal the most complex nuances of any program material with an open, transparent response. The S3X-H employs a 4" HexaCone midrange driver for more detail and musical coherence in the critical midrange frequencies, along with two 7" Hexacone woofers that produce a deep, tight bass within the same frequency and radiation pattern, according to ADAM. The compact S2X nearfield monitor utilizes a HexaCone 7", X-ART tweeter and A/B amplifier combination to produce a balanced sound with deep bass for a smaller enclosure. The S1X monitor also combines the X-ART tweeter, A/B amplifier and HexaCone woofer driven by premium PWM amplifiers. The front panel of SX-Series monitors feature controls that allow the user to adapt the speakers to the sound room. All SX-models (except the S1X) can be optionally retrofitted with a 24-bit/192kHz D/A Converter featuring an AES/EBU (XLR) and SPDIF (RCA) inputs as well as an R/L/Mono switch, ADAM says. Pricing is available from the manufacturer upon request. For more information, visit www.adam-audio.com. JamHub Silent Rehearsal Studio JamHub say they've created a new genre of music gear: the portable silent rehearsal studio.